After pulling back from 4-year highs last week, US oil started the new week on a weak note after reports that mentioned that production is ready to be increased by Qatar and Saudi Arabia. However, during today's early session, reports of explosion at Canada's biggest refinery have sent the price to recover back above the $74 level. US oil prices added some losses during yesterday's session but did not break below the $73 level. 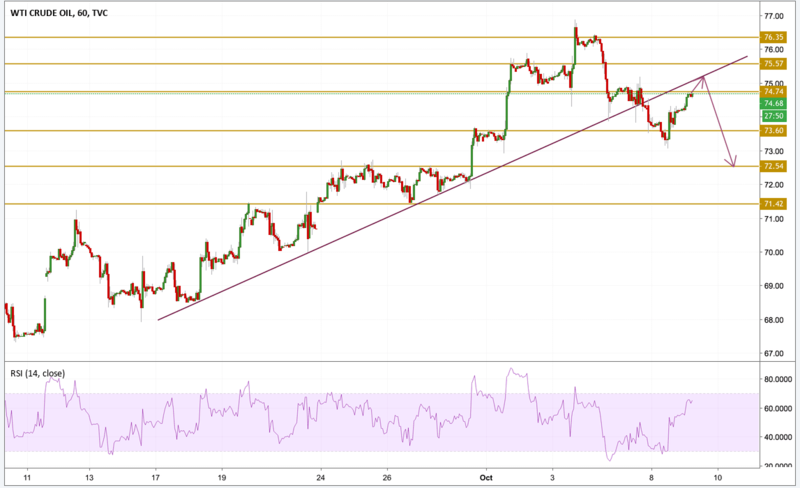 The price is now back up after picking up momentum from a divergence and currently hovers just below the $74.75 resistance level. A retest of the purple trend line is more likely to happen before we can see another downward move and this time we will be focusing on the $72.5 support level.